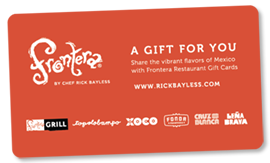 Share the vibrant flavors of Mexico with Frontera Restaurant Gift Cards. Please note: Orders placed between Jan. 1-9 will be processed Jan. 10. Cards may be redeemed in Chicago at Xoco, Frontera Grill, Topolobampo, Fonda Frontera, Cruz Blanca Cervecería, Leña Brava and Bar Sótano. Gift Card purchase requires a minimum card value of $15. All orders placed by noon Central Time will be processed the same day. Orders placed on Sunday and Monday are processed on Tuesday. All orders are shipped from Illinois. ALL SALES ARE FINAL.